The "Owens" nuclear test, 25 July 1957, part of the Plumbob test series held at the Nevada Test Site. The explosive yield of the device, designed by Lawrence Radiation Laboratory, was 9.7 kilotons. 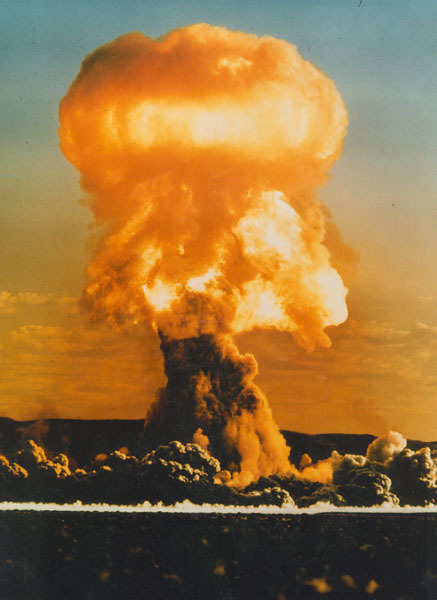 For details on the Plumbob series, see the Department of Energy publication, U.S. Nuclear Tests, July 1945 through September 1992 at <htttp://www.nv.doe.gov/news&pubs/publications/historyreports/pdfs/DOENV209_REV15.pdf>, pp. 30-31.